Do you want to know how I know I married the perfect man for me? He's really picky when it comes to food. Why does that make him perfect for me? Well, you see, here I am as someone who develops recipes as part of her freelance business and I have a man who is not happy unless a recipe is perfect. When Jesse asks for blueberry muffins, he wants said muffins to taste like this glorious blueberry muffin he bought in the middle of nowhere on a Tuesday when it was raining from a lady who was wearing a floral shirt and had brown curly hair. Jesse might not remember when our niece's birthdays are - and he might not remember what we did last week, but he always remembers food. I kid you not. Jesse tends to remember movies by the food that was featured in it and he can remember things we did only by what he ate that day. In fact, as I'm writing this post he's just told me that the movie Casino with Robert De Niro has a scene all about blueberry muffins. I've never even seen that movie - but a quick google search confirms he's right. And it's that crazy memory and desire for perfection that is the reason why there's never been a classic blueberry muffin recipe on Southern In-Law until now. We've been working on one for what feels like forever but there was always something missing - not enough blueberry flavour, too many blueberries, too ugly looking, too purple, too moist, not moist enough - just not right. But then a few weeks ago, on a whim I decided to do something totally different. I realised that the blueberry muffins Jesse was referring to weren't exactly natural. In fact, they were full of artificial flavours and additives to create a blueberry tasting muffin that maybe contained three real blueberries. 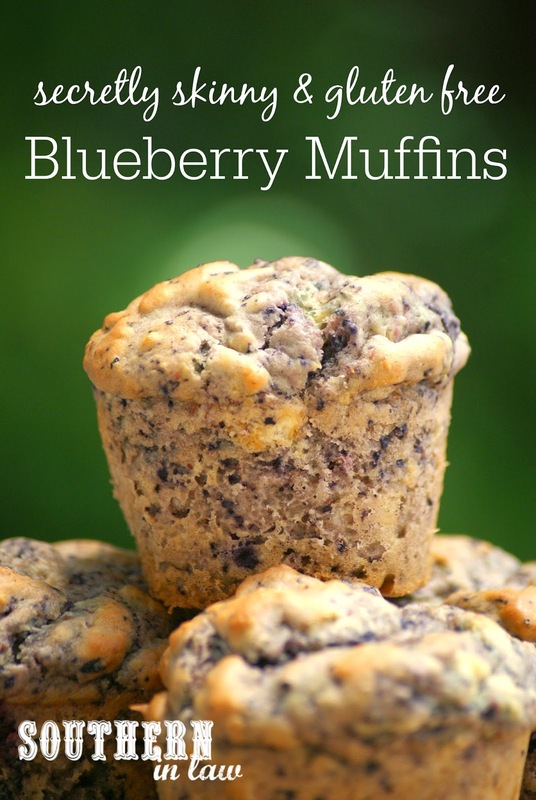 So how could I pack in that blueberry flavour without adding any artificial nasties and still keeping the muffins healthy, gluten free and lower in sugar and fat? Easy! Double the blueberry content and used a new technique. 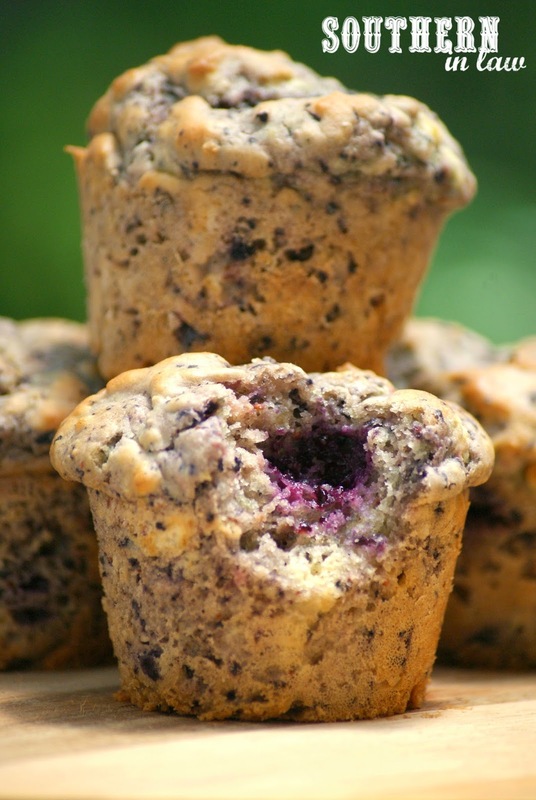 For these blueberry muffins I decided to blend the majority of the blueberries and keep some whole. That was you got delicious blueberry muffins that rose to perfection with an awesome texture and were full of blueberry flavour with just enough juicy blueberry bursts. 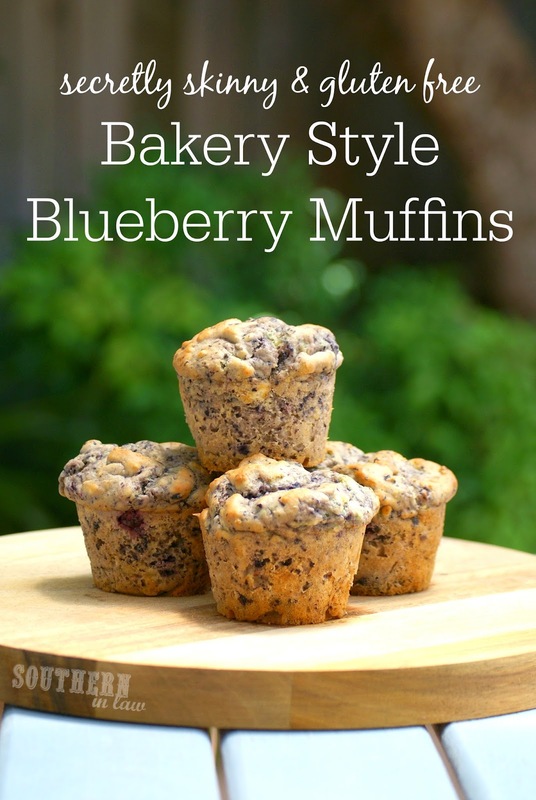 They are seriously the best blueberry muffins I've ever made - and the best blueberry muffins we've ever had and we keep making them over and over again. You'd never guess they're healthy whatsoever and they're so simple to make! Preheat your oven to 190C/375F and grease and/or line your muffin tins or small loaf pan. Mix together your flour, baking powder, salt and sugar and set aside. Meanwhile, blend 3/4 cup of your blueberries (leaving 1/2 cup whole) and set aside to mix in later. Mix your melted butter, vanilla extract, yogurt and eggs into your flour mixture, mixing until just combined. Next, stir in your blended and whole blueberries, mixing until just incorporated and spooning your muffin batter into your prepared tins. 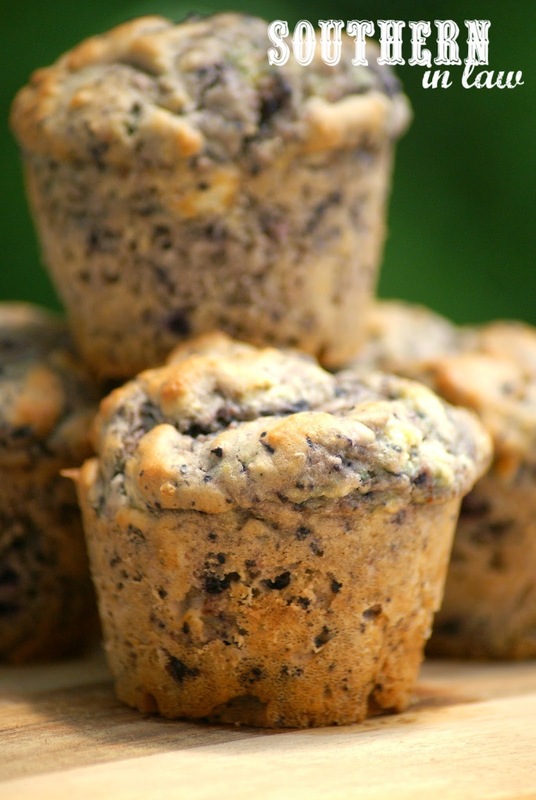 If needed, add some milk or water to make a thick muffin batter. You'll want to fill your muffins about 3/4 of the way full so they have room to rise. Bake your muffins for 10-15 minutes or until cooked through and a skewer inserted into the middle removes clean or 20-30 minutes for a small loaf. But tell me, what's one movie you link to a certain food? And are you someone who remembers exactly what you ate at a certain place like Jesse - or more like me and tend to remember places and things instead? Jesse's biggest movie links? Aladdin and french bread, Lady and the Tramp and Spaghetti, Goof Troop and Spray Cheese, Alice in Wonderland and Oysters..... your turn! I followed the recipe exactly but there was way too much flour and not enough liquid. I could barely incorporate the ingredients. I even had my husband look over the ingredients I added to be sure I hadn't forgotten or misread anything. Out of pure curiosity, I baked the dough to see what would happen, and they were inedible. I used Pamela's GF all purpose flour and was wondering if the brand might have something to do with my baking failure? Did I read it correctly- 1 and 3/4 cup of flour? The recipe looks wonderful and I would love to give it another try! Any advice is appreciated! Thanks! Hi Melissa, that's really odd as we've made this recipe multiple times (and have pictures from readers around the world who have made and loved them too!) and have never had this problem. The first thing that may have been the problem is how you measured the flour - do you measure flour by weight or by cups? The second may be the flour itself - I've never used Pamela's products so I don't know what they're made up of or how they usually work when baking. With your Greek yogurt, did you use a really thick Greek yogurt? Sometimes you can get Greek yogurts which are "drier" so you may have just needed to add a bit of milk to get the right consistency at the end, however, it doesn't sound like this was the problem. I also tried making these, they look delicious! But my batter was incredibly too dry and hard to mix together. I tried adding additional milk in case my yogurt was 'drier' like you suggested to other commenter. However, this didn't help.. it ended up in one big chunk, I also baked and it was inedible :(. I used Namaste gluten free flour which has always given me great results. Is your flour ratio off? - did you blend a portion of your blueberries as the recipe says? - what size are your eggs?